Susanna Clarke’s Jonathan Strange and Mr. Norrell is an extraordinary book, but Bloomsbury’s attempt to market it as “Harry Potter for grown-ups” is misleading. Clarke’s ten-years-in-the-making debut novel is a witty, wildly imaginative book that’s certain to knock the socks off any English Lit major, but that doesn’t mean that has the widespread appeal of J. K. Rowling’s series. While I understand the need to promote what was obviously a costly book to produce, Jonathan Strange and Mr. Norrell is simply not a novel that is well-served by a one-fantasy-fits-all label. Jonathan Strange and Mr. Norrell is set in a Regency-era England where magic, once a part of everyday life, has faded away. Struggling with the war against Napoleon, English society is stunned and delighted when an unknown gentleman named Mr. Norrell appears upon the scene, claiming to be a practicing wizard and offering his services to defeat the French. Mr. Norrell isn’t the only practicing magician in England for long, however. When a young man named Jonathan Strange also discovers a talent for magic, Mr. Norrell accepts him as a pupil, and the two join forces to defeat Napoleon. While their military collaboration is successful, their student/teacher relationship is far from easy, and they eventually fall out over the proper approach to English magic. There are many things to admire about Jonathan Strange and Mr. Norrell, but few of them are the same things worth admiring about the Harry Potter books. Clarke’s characters, even the minor ones, are beautifully fleshed out. Rowling’s characters, with a few notable exceptions, are a collection of enjoyably familiar stock players. While Rowling’s books can be tremendously funny, Clarke’s humor comes largely through the dry, fundamentally English tone of her narration (which is the best imitation of a 19th century novel that I have ever seen). Both novels feature gorgeously detailed settings, but to very different effect. Rowling’s world has a fantastic, essentially visual appeal, filled with portraits that move and talk, an owl-based postal service, and buildings rearranging themselves when no one is looking. These tidbits provide the Harry Potter books with an enormously entertaining--but basically unnecessary--backdrop. The details in Clarke’s book are a vital part of her plot, establishing the historical setting and giving the novel its elegant, eerie atmosphere. 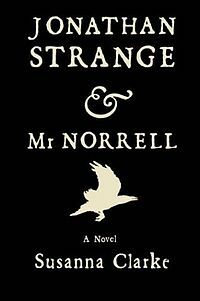 There are some superficial similarities between the Harry Potter series and Jonathan Strange and Mr. Norrell. They’re both entertaining, they’re both about English magicians, and they’re both really, really long. But if you buy Jonathan Strange and Mr. Norrell because you’re looking for a darker, more complicated Harry Potter story, you’re setting yourself up for disappointment. If you truly want a more mature version of Harry Potter, read Vertigo Comics' The Books of Magic series, but if you’re looking for a story with the ominous atmosphere of a Bronte novel, the complex structure of an A.S. Byatt book, and the eyesight-ruining length of War and Peace, Jonathan Strange and Mr. Norrell is the book for you. It took me a month to finish it, but it was totally worth it! It's a beautiful book.